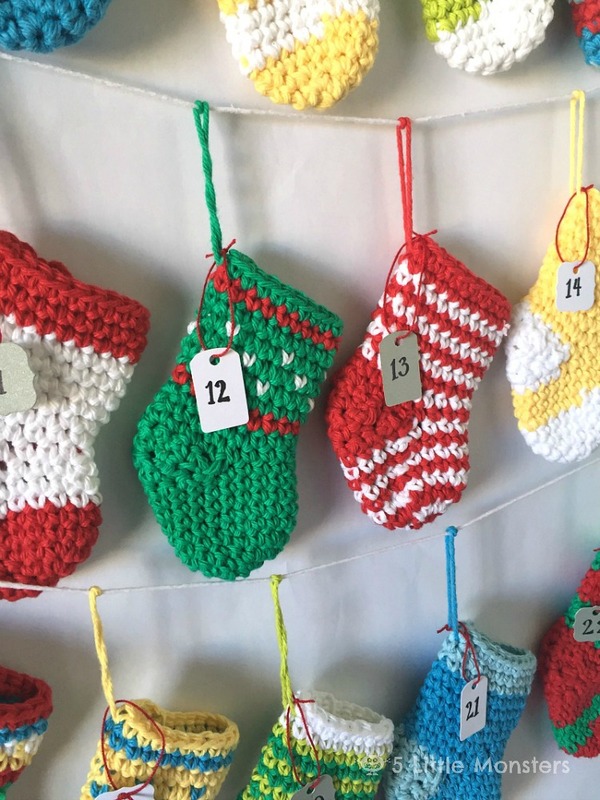 I have been wanting to make a crocheted advent calendar for quite a while and I was determined that I was going to get it done this year, and not only was I going to get it done, I was going to get it done early enough that we could actually use it. Every year it seems like I don't think about making things like this until it is too late. When I was trying to come up with a gift idea for this week's round of So You Think You're Crafty I was having a really hard time thinking of something because a gift could really be just about anything. Then I thought, maybe I don't have to make the actual gift, I could make the gift delivery system instead. It is still related to gifts. Maybe that is a little bit of a stretch but my kids love advent calendars and getting a little treat everyday so I thought it would be fun. Plus it was my chance to make something I had been wanting to make and I kind of had to get it done quickly. At one one point I considered stopping after 12 because by the time I decided on a project I only had a few days to get them all made and it also happened to be the week of Halloween so it seemed like we had a million other things going on that week. They are really easy to make but there are a lot of them. 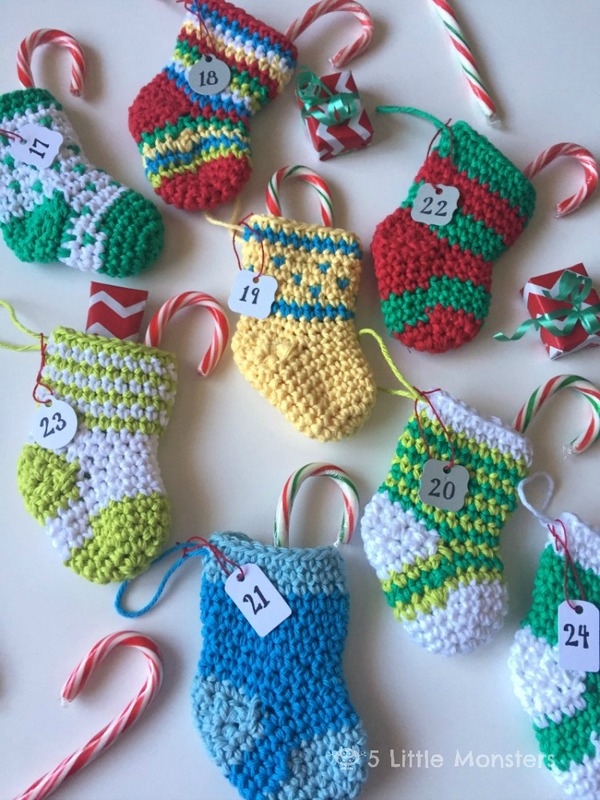 I am really glad that I stuck it out and made all 24 because I loved the way it turned out and some of my favorite stockings were some of the last ones that I made. I think this green one (#12) is one of my favorites, it kind of reminds me of a fair isle type of design. I wanted my stockings to be really bright and colorful, but also feel christmasy so I started out with red, white and two shades of green. Then I added some blue and yellow just for a little more color. 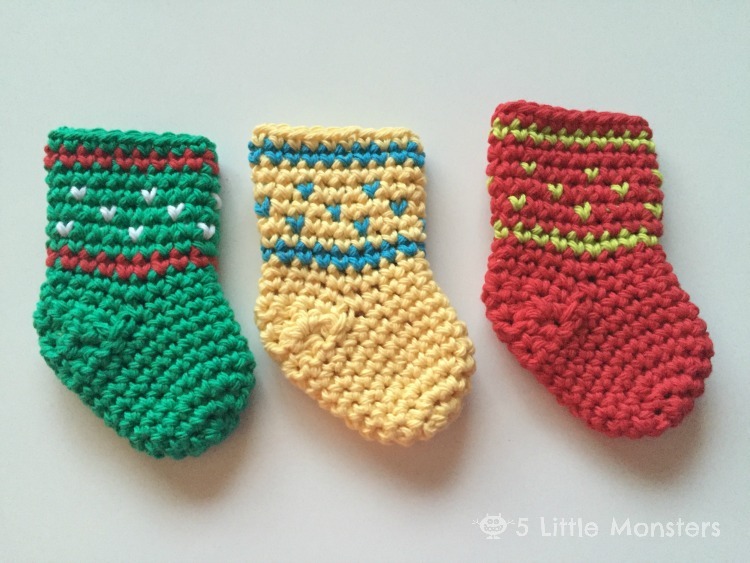 I used those colors to create different patterns and designs on the stockings. I wanted each one to be different, no two stockings are the same. 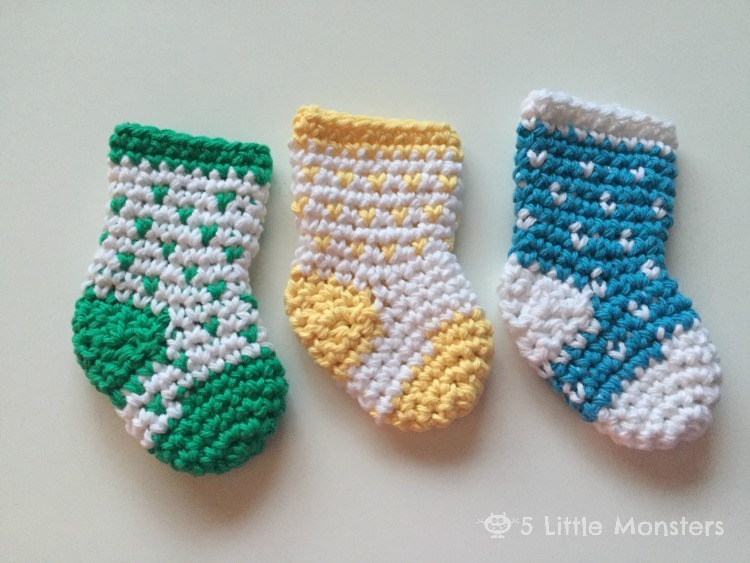 The actual pattern is the same for all of the stocking is the same, just the color changes make it different. 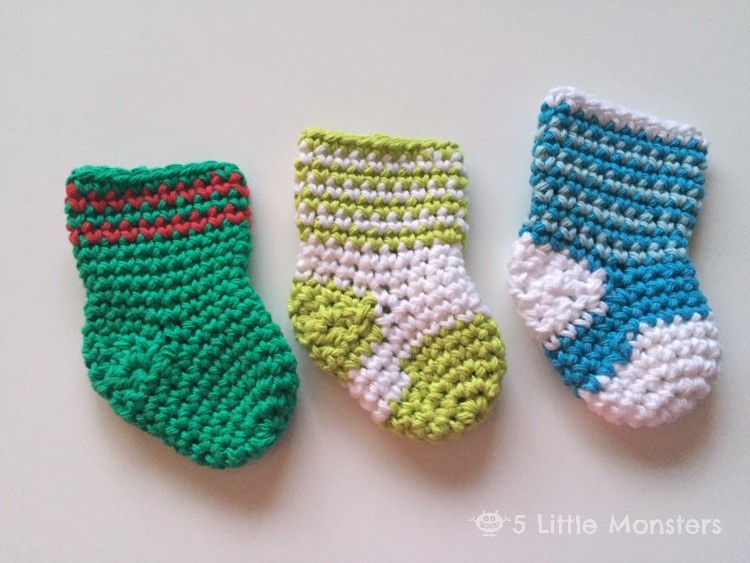 I am going to share the basic stocking pattern and then show the different variations I made with a brief description of how I made them. If you don't want to make 24 of them you could just make one or two and use them as Christmas ornaments. For the number labels I bought some little mini tags and wrote numbers 1-24 on them, then I cut a small piece of crochet thread and tied them onto the hanger strings. 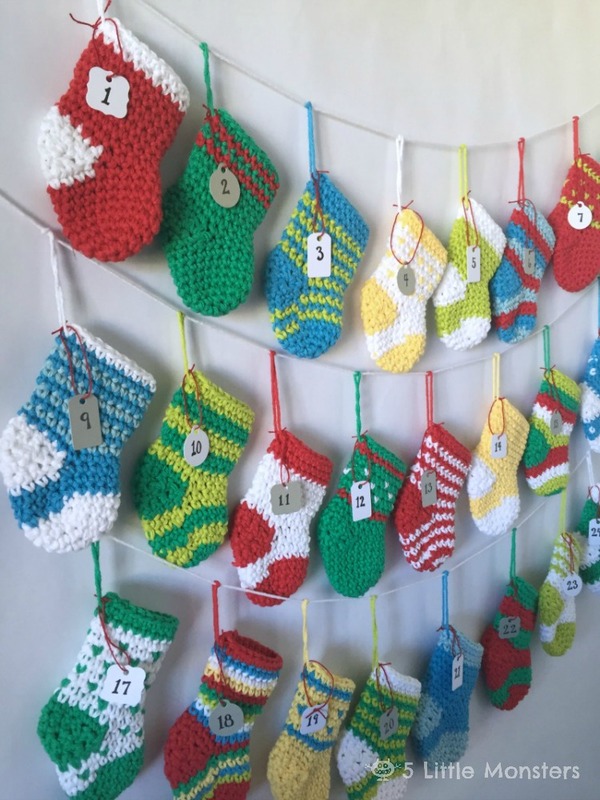 To hang my stockings I just hung them on 3 pieces of cotton yarn, 8 on each strand. I put the yarn through the loops twice to help them stay in place. The first variation I just did a simple 2 color stocking where the main body of the sock was one color and the heel, toe, and cuff or some combination of the three were different colors. To make these stockings I used one color for the first 5 rows, then switched to the main color for the next 3 rows, then back to the contrast color for the heel section, after that I switched back to the main color until the last 2-3 rows when I switched back to the contrast color for the cuff. 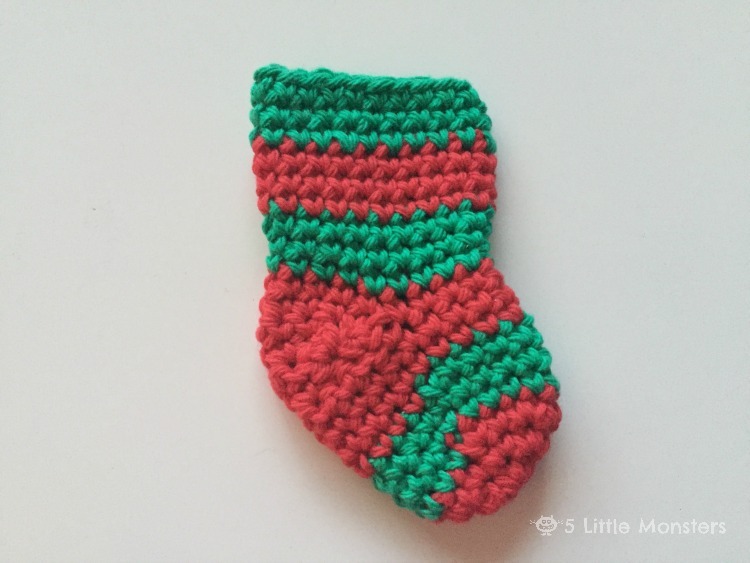 I made one of these in each color because they were probably the easiest to make and it is just a classic look for a stocking. I only made one of this design because I felt like these stripes were a little thicker than I wanted but for this design I changed colors every three rows. Because the heel fell in the middle of one of the 3 row sections I just continued with that color for the heel and the final of the 3 rows before switching to the next color. For these stripes I changed color every two rounds. I used 2-4 colors working 2 rounds in each color. These stripes were made by changing colors every round. When making these it works better if you join each round so that the stripes line up. On the red and white stocking I started changing colors right away, on the other two I worked the toe for 5 rounds, then three in the stripe pattern, before working the heel. I worked 2-3 rows of the same color on the top for a cuff. 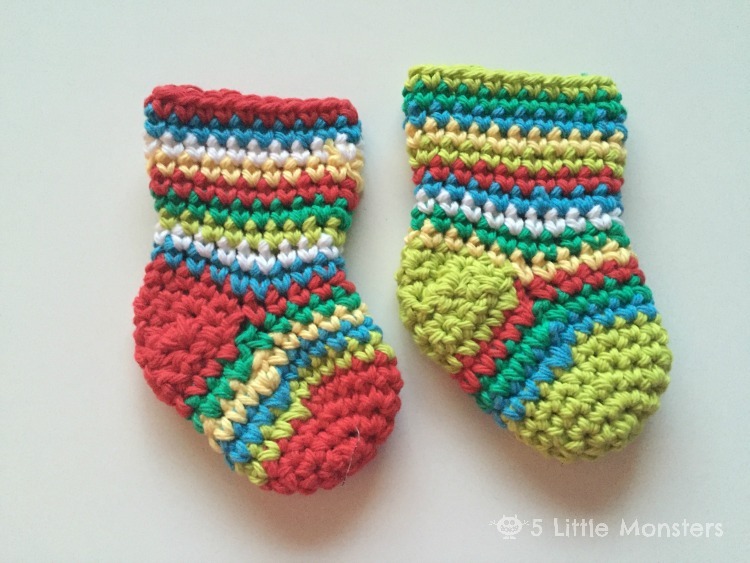 These socks are made the same way as the thin stripe ones above, the only difference is that rather than switching between 2 colors I used several different colors. I started by working 4-5 rows of one color for the toe, used that same color for the heel and worked the very last row in the same color. 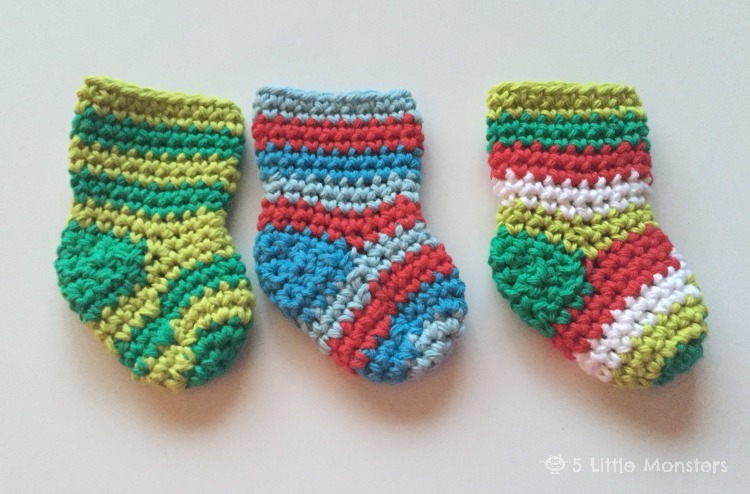 These socks also use the same thin stripes as the last two designs but instead of changing colors the whole way I only switched colors for a few rows at the top of the sock. 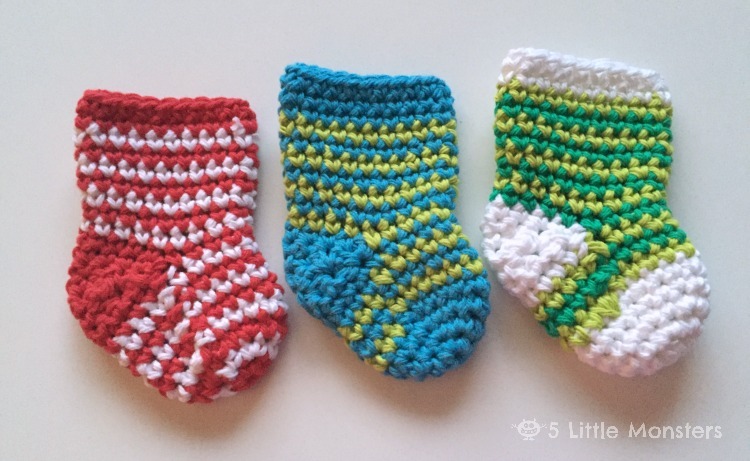 For these ones I made alternated one single crochet of one color with 1-3 single crochets of the other color. I did find that the neatest way to do this is to only change color when you insert the hook in and pull up a loop, pull that loop up with the new color but work the rest of the stitch in the other color. On the blue sock I worked the whole single crochet in white and you can see it left a little extra white above the v, but on the green one the little green v's are a lot neater because I only changed color when pulling up the loop. Also, on both the blue and yellow ones I worked a solid row between the spotted rows. On the green one I just spaced them with three whites in between and for the next row I worked them so that the green v was above the center white stitch. For these socks I did a combination of the last 2 designs. On the cuff I worked the first 2 rows in the same color as the rest of the sock, then I worked row 3 in a different color, row 4 in the first color. The next 3 rows were worked with three stitches of the main color followed by one of a different color, I did it the same as I explained above only changing color when pulling up the loop, then a row of the main color, a row of the contrast color and the last row in the main color. 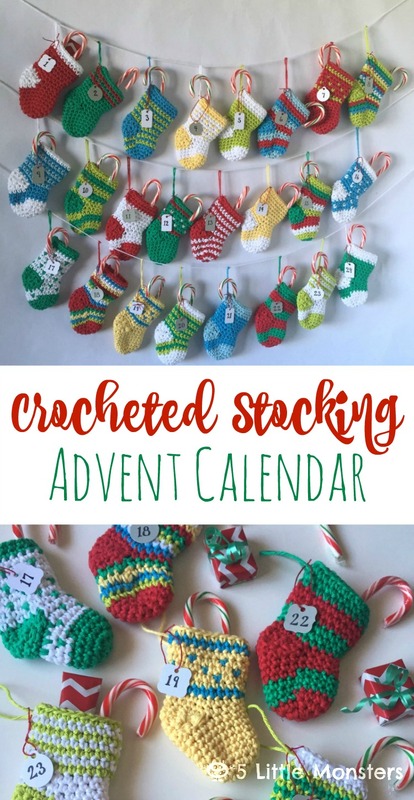 I think the main thing is just to play around with the colors and have fun as you crochet your stockings, there are so many different color combos and designs you could do. 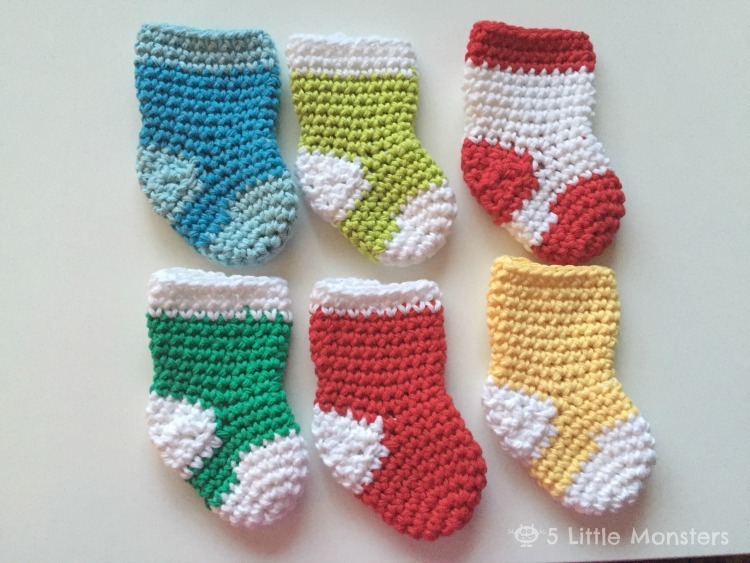 If you don't want all of your socks to be different you could pick a few designs and repeat them or you could use fewer colors than I did, like just red, white and green, or you could add more. Once you are finished hang them up and fill them up with little treats to count down the days until Christmas. These are so cute! Thank you for sharing your pattern. I've always wanted to make an advent calendar too, but could never decide on what to make. This is definitely going on my rav queue. Is there a video tutorial for these? I am so confused in the heal part and sl in the side of the precious row. Am I just reading it wrong? I was really worried that that part would be confusing. It was hard to write out the instructions in a way that made sense. I don't have a video but I think that would be a great idea. I will try to get one made and post it, I think that will be the easiest way to explain how to do it. I got the video posted, it should be one of the newest posts on my blog. I hope it helps clear up some of the confusion. Let me know if you have any more questions. Beautiful! Thank you for sharing, the stocking are so cute! this advent calendar has to be one of the nicest things I've ever seen. I am new to crochet but have every intention of trying it and hopefully it'll be ready for next Christmas. Thank you very kindly for sharing this pattern. Hi just to let you know there seems to be an error with the heel part. I watched your video and you made a turn at rows 5,6 and 7, but this was not in your pattern. Thank you for offering it free! !